St Feichin’s Cemetery is situated in the townland of Lacken, formerly Lackan, – just over one mile from the village of Abbey. 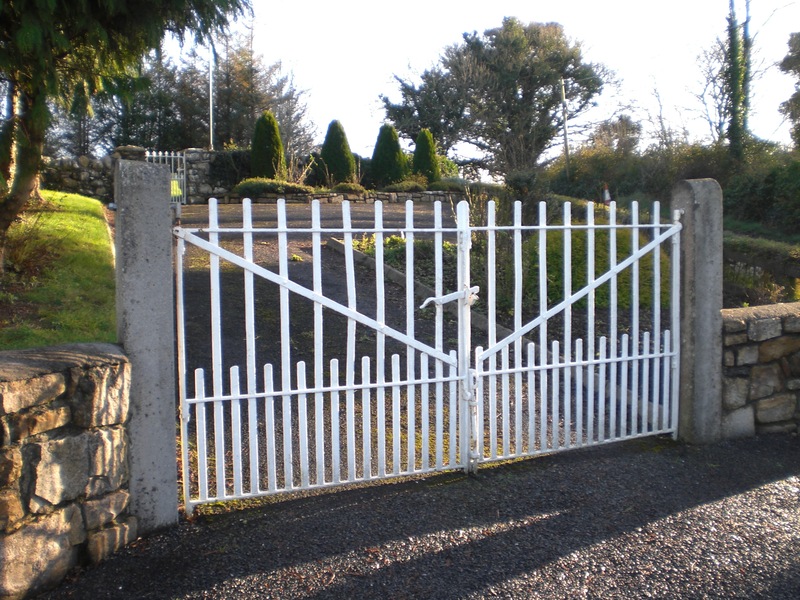 St Feichin’s Cemetery, Lacken – gates leading into the cemetery. This cemetery took its name from St Feichin, a 7th century Irish saint. St Feichin was born in Co Sligo and is linked with many places throughout the county. He is also associated with several places throughout Co Galway especially Omey Island and also with Fore in Co Westmeath. Tradition tells us that St Feichin spent some time in the parish of Abbey setting up a small wooden chapel in Lacken. The holy well in the adjoining field became a place of pilgrimage and over the years pilgrims visited the site in search of cures especially for problems with their eyes. The cemetery that later developed on the Lacken site became known as St Feichin’s Cemetery. 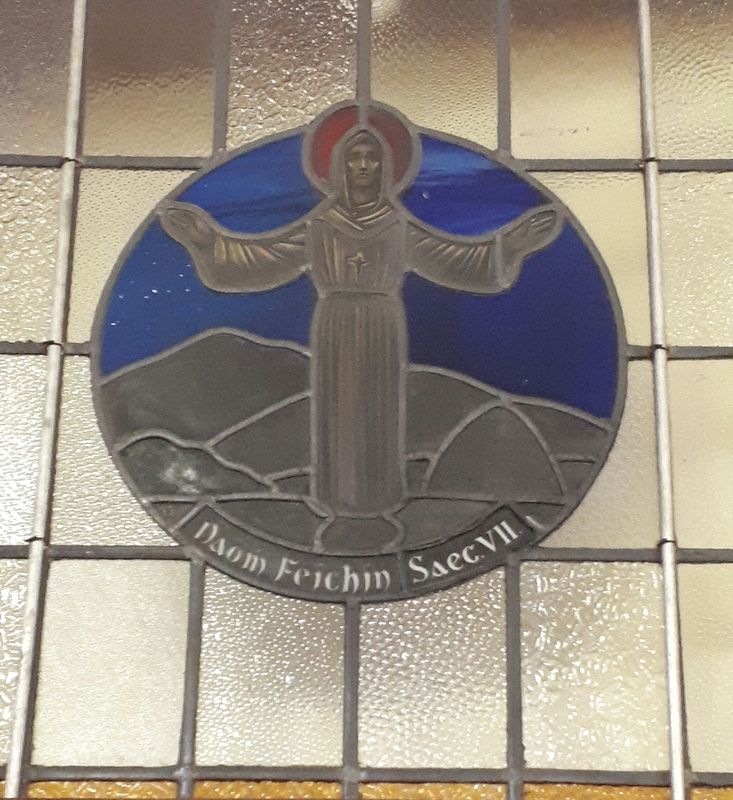 Today Feichin is honoured as the patron saint of Abbey and annually a Mass is celebrated in the cemetery to commemorate all those who are buried there. Priests and people from the surrounding parishes come together to participate in the Eucharistic concelebration each July. In the past, Lacken cemetery was a local burial ground and we believe that in famine times mass graves were opened in this cemetery to bury the large numbers who had died from starvation. 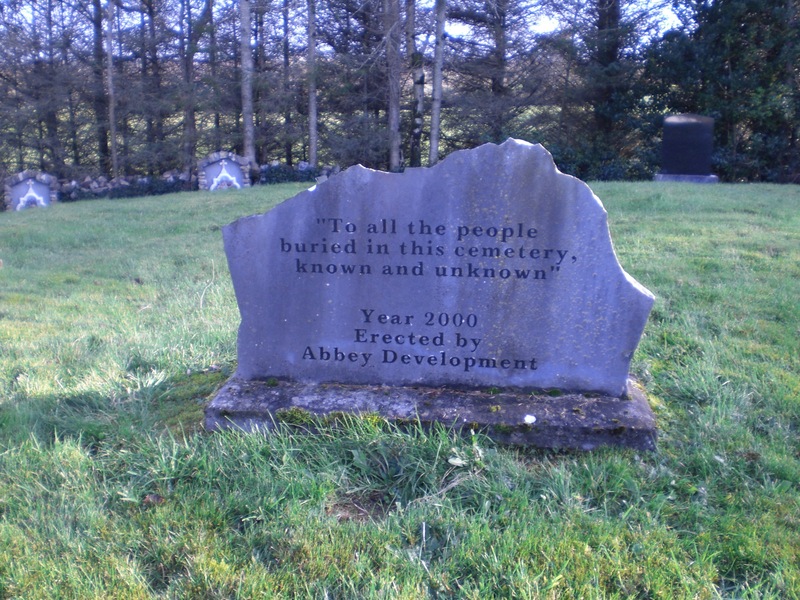 In the year 2000, Abbey Development Committee erected a memorial stone in memory of all those who were buried in the cemetery over the years. 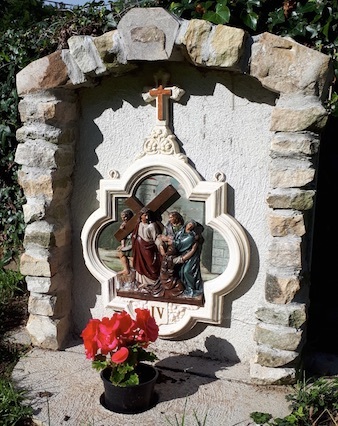 In July 2017 an additional event took place when a set of outdoor Stations of the Cross, which had been donated to Lacken Cemetery, found a new home. They were erected and blessed at the annual Mass. 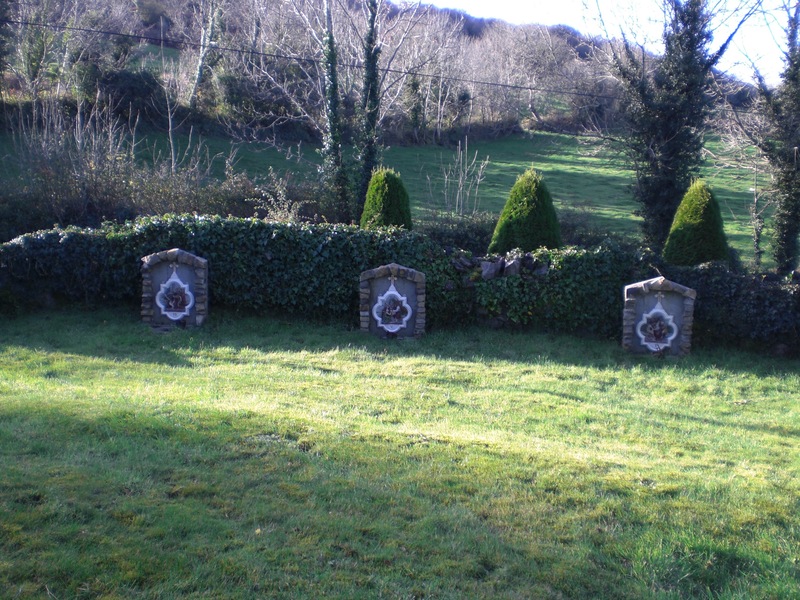 These Stations of the Cross were located in the garden of the Mercy Convent in Doon. Co Limerick. There, the Mercy Sisters who had left Kinsale, Co Cork in 1865, set up a mission to support and help the local people of Doon following the devastation caused by the famine. After 151 years of service in Doon, the Convent of Mercy closed in 2016 and the contents of the convent were auctioned. Fr Brendan Duggan, CSsP from Athea, Co Limerick purchased the outdoor Stations of the Cross at the auction. Fr Duggan was familiar with the famine graveyard in Lacken Cemetery where he had been a concelebrant at the annual commemoration. 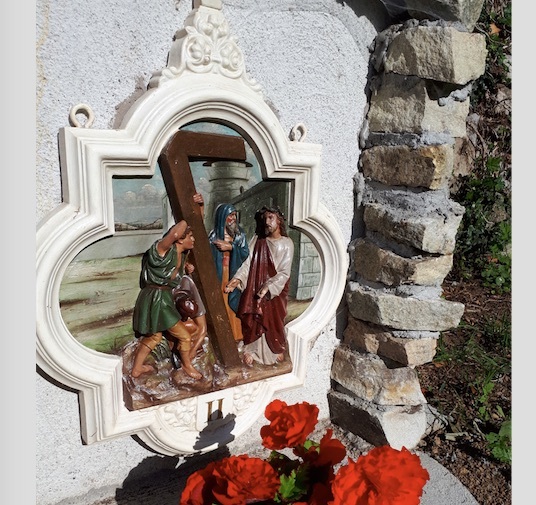 He very generously offered the Stations of the Cross to Abbey parish and in July 2017 they found this new home where they can be venerated by generations in the years ahead. Thanks to Margaret Burke, Abbeyville who researched the history of the Stations and to Therese Murphy, Lacken who supplied photographs of the Stations in Lacken for this article. This page was added on 12/11/2017.